August 28 - Let's talk a little bit about jealousy, shall we? The topic has been on my mind for a few days as my own sense of jealousy - which I'd long assumed to be dead (or at least dormant) - has once again reared its ugly head. When I was a much younger man, I was often overcome with envy, usually after viewing an amazing piece of artwork. I'm not talking about work produced by an established master. That would have been like being jealous of the sky for being blue. No, my greenest envy was reserved for artists whom I knew, or those with whom I believed I "ranked" (and "ranking" was, itself, a version of jealousness, as I imagined where "on a scale of 1 to 100" I compared, in my mind only, with all other artists in my genre). If any of these artists produced something extraordinarily beyond my expectations of their talents, my guts would grind with jealousy pains. In those early days, which included my Kubert School experiences, I truly believed that such envy was not only an important component in my artistic development, but a healthy one as well! I reasoned that it forced me to compete, which, in turn, forced me to improve myself. I can't completely deny the logic of that, but neither could I ignore the actual, physical illness that I'd feel afterward. There are those who will espouse envy (a form of greed, really) as a productive motivator. We comics artists - if I may indulge myself with such an inclusion - are, in theory, competing for essentially the same audiences (and their dwindling dollars). In competition, there is rivalry, and in rivalry there is often jealousy. Still, that attitude was putting my intestines into sour knots, so I finally came to the realization that envy was not only unhealthy (clearly), but not the motivator I'd once believed. When it came right down to it, I was never spurred to greater things upon seeing another's artwork. I was either too involved in making "excuses" for my suddenly apparent inadequacies, or wallowing in self-loathing. No, for me, jealousy was an evil habit that I had to kick. Like many addicts, I couldn't go cold turkey, so I stepped back in manageable increments. First, I let go of thinking "Anyone could have done that," then expunged "I could have done that," and finally settled on a healthier "I should have done that," which is more of a true motivator. With that, I learned that I can happily encourage other artists, that I can genuinely enjoy their work, and that I am in competition with no-one but myself. Or so I believed, and so I acted, until this last couple of weeks. That's when I was struck by a wave of stanky, old-school, fluorescent-green envy. 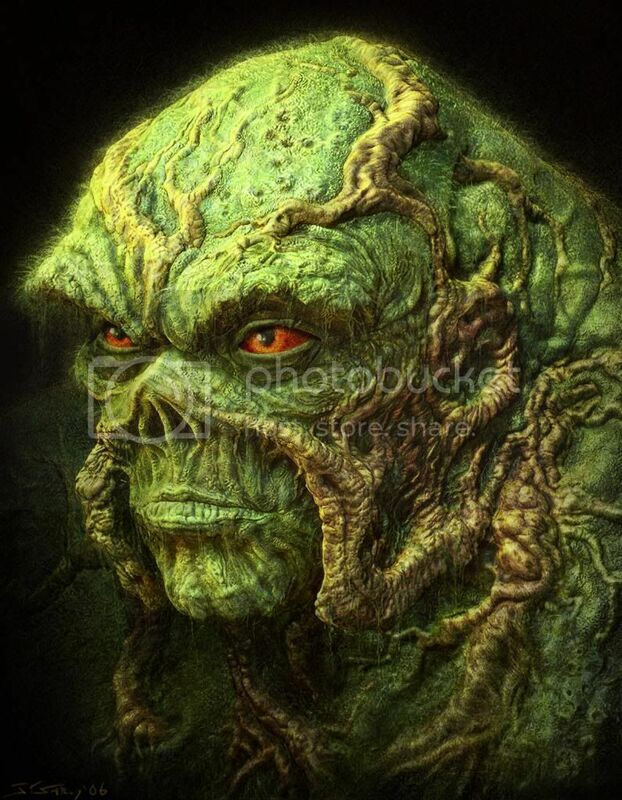 It started with finding an absolutely gorgeous image of Swamp Thing on-line. While talking to John (Mundt, esq. - artist extraordinaire) today, we touched on a lot of different ideas, but we kept coming back to creativity and what is inspiring and what makes some artists stand so head and shoulders above the rest. Sweat equity? Hand of Dog? Genetics? Who knows. Regardless, as we wrapped up, I mentioned that I was going to start this blog, imperfect idea or not (another idea we touched on in the two hours we sat in the coffee shop, landing pads for flies - “look one has a flag!”). 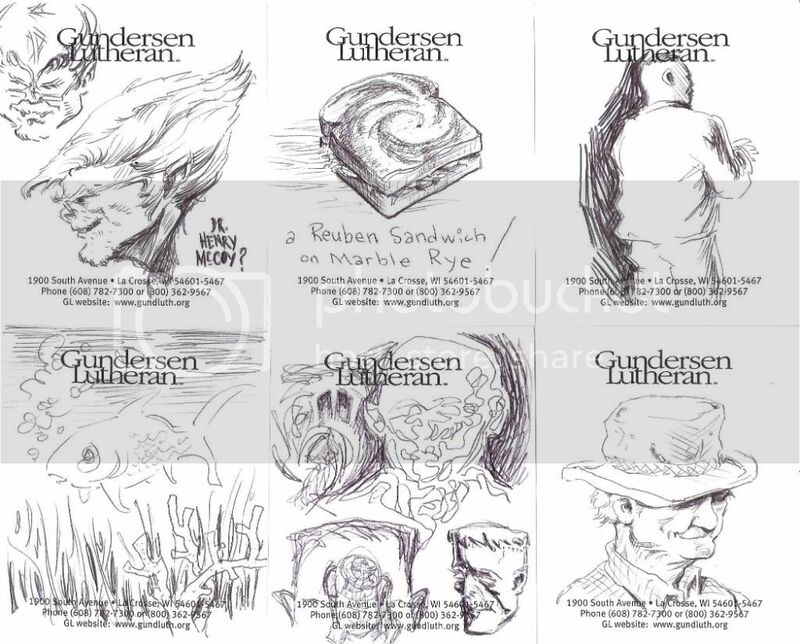 It is based on an endeavor of another artist friend of John’s, Cary Kann, who has, for quite some time, forced himself to sit down and drawn something every day. After hearing that... I figured it was about time that I had a blog that had a point. And, true to his word, he has produced some sort of creative artwork every day since then. Poetry, music, photography, and, mostly, virtual works have been spitting out of him like Africanized bees from a hive. Each day's product is at least interesting, usually amazing, and too-often jealousy inspiring. Best of all, jake is finally garnering some of the wider recognition and praise that he so richly deserves. Damn him. So, here I sit, stewing in envy, trying to figure out why I fell so hard off the no-jealousy wagon. At least I'm still happy for another artist's successes, but not without a side order of stomach-churning green fries. As best as I can guess, my jealousy has something to do with the computer as medium. In regard to the flood of virtual art of the last two decades, I'm positively antediluvian. I often wonder how my life, and relationship with computers, would differ had I been born just a year or two later. In 1984, just before I graduated high school, there were four computers in our entire school, and those were used exclusively by advanced Math students for basic programming. The following year, when I was a Joe Kubert School student, Joe had just acquired the computer set-up that had been used to create the "cyber" elements of the film Tron, but only third year animation students were allowed to mess with it. Over the next few years, while such computer access restrictions eased, my sorry financial situation, coupled with my inglorious return to my parents' basement, kept me from being exposed to any of the advancements made in computer generated art until after I had become a curmudgeonly "established" artist (and by "established" I certainly don't mean that I was "recognized" or "employed," just that I'd become ensconced in my own peculiar ways by then). Had I been a member of, say, The Class of 1986? Who knows? So, here I sit, envious and bitter, and apparently none-the-wiser for the journey. Hmm. Actually, now that I've talked about it, I feel a little better. In fact, I feel great! Well, now I must be off to my next exciting adventure, but not before asking once again for your suggestions for September's "...Of The Day" theme. If you've got an itch to see a topic discussed, just let me know before Tuesday, September 1st. Thanks in advance! See ya! 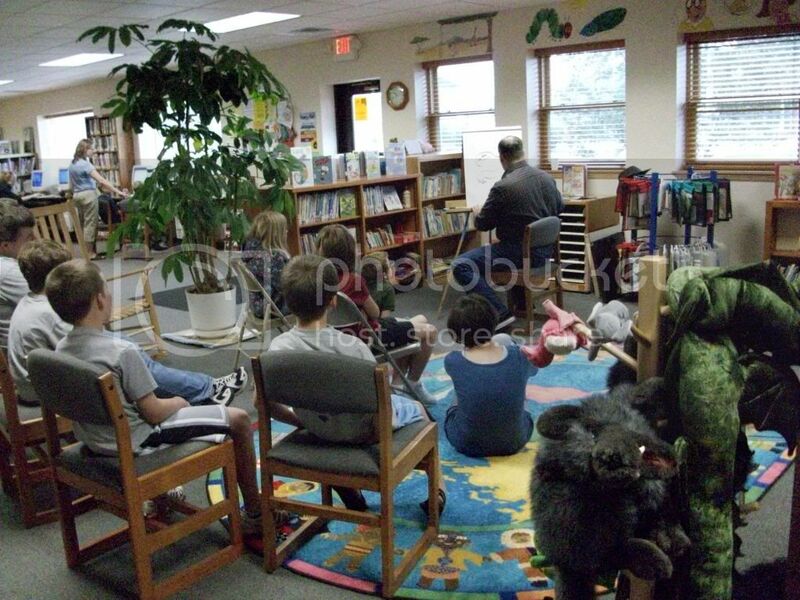 I wanted to thank you for the wonderful job that you did with the kids here at our library. They are still talking about you. Thank you for your professionalism. I also wanted to apologize for running out on you that day. My 3 year old son had an old heavy 32" TV fall on him at home. He is fine now, but mom was pretty freaked out for awhile. Thanks again and good luck in your future ventures! I wanted to be sure that everyone was OK before I told you about the unusual way that the event ended. That, I suppose, brings me back to my father-in-law, Steve. His surgery was certainly unique, even to his battle-tested heart surgeon, Dr. Paramesh, who called Steve's heart "definitely one of the top five worst" he'd ever seen. What made it so unusual was that Steve, a non-smoker/non-drinker, had none of the blockage-type problems that plague most cardiac patients. In fact, the vessels that usually need to be bypassed were, on Steve's heart, in excellent condition. Still, after a battery of tests, he was told that he needed dramatic, immediate surgery or he wouldn't live more than another six months (and that was the optimistic prognosis). Apparently, Steve had a congenital defect. One of his valves and a portion of his aorta had always been malformed, causing damage and, essentially, premature aging. In the twelve hour operation that began early the next day, both were replaced. Since then, Steve's recovery has been close to miraculous. He wasn't even expected to come out of sedation for two days, but was awake and speaking - hoarsely - just a few hours after surgery. Instead of "perhaps a month," his hospital stay, from diagnosis (after which he was quickly admitted), through surgery, to release earlier today, was almost exactly one week. A week! So, as frightening and serious as everything was, I think that Steve should consider himself incredibly fortunate to have had things transpire as they did. Now, I think I need some rest. With the exception of Saturday (when I had to work at the dreaded "real" job), I've spent the last few days with my wife, the lovely WOMP Staff, either sleeping in waiting rooms, waiting in waiting rooms, or driving and/or walking to and/or from waiting rooms, so I am going to try to get some sleep (in a real bed! neat!). As I wrap this up, I've got no "...Of The Day" feature for this month now that I've finally posted all of the Comic Book Father Characters from my list (begun in April), so I'll leave you with a question; what theme would you like to see presented as September's "...Of The Day" feature? Send in your suggestions before the end of the month. The "winning" theme suggester (if there is one) will get a special mention in the ol' WOMP-Blog, a link to whatever they want to promote, and the gratitude of a lapsed blogger whose brain is pretty frazzled right now. Thanks! See ya! *WOMP-Blog Archives EXCLUSIVE! * - Posted below are some of the many, many drawings I doodled on a little note pad while my father-in-law was in surgery. Some depict other "waiters," patients, or staff, but most are the scribbled ramblings of my own preoccupied imagination. Enjoy? August 18 - Whew. What a long day. 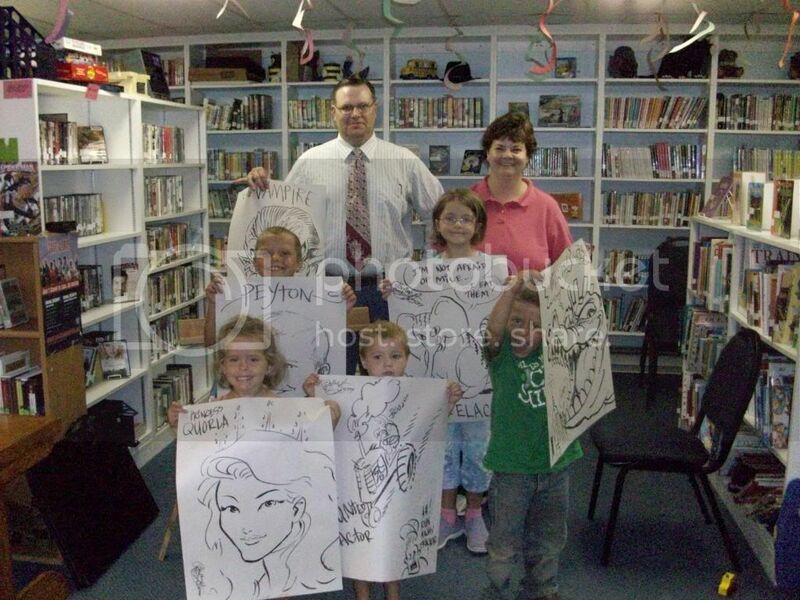 I had a wonderful time in Montfort on Monday, speaking and drawing for kids at their library. There is more to the story, but I'll have to get a little more information before I tell you about it. Sorry, but after the next WOMP-Blog posting you'll understand why I must be so mysterious. I just have to check on something before I can talk about it. Oh, and speaking of checking on things, my father-in-law, Steve, had a check-up today, at which he learned that he must immediately have heart surgery! He goes in to the hospital tomorrow (Wednesday), after which we will all know more about what will happen next. Right now, it looks like he will need a valve replacement. He is understandably scared, and so are we. Hopefully, everything will work out just fine. I'll keep you posted. In his honor, I'll leave you with the first, and only, Comic Book Father-In-Law Character of The Day - Dr. Franklin Storm! 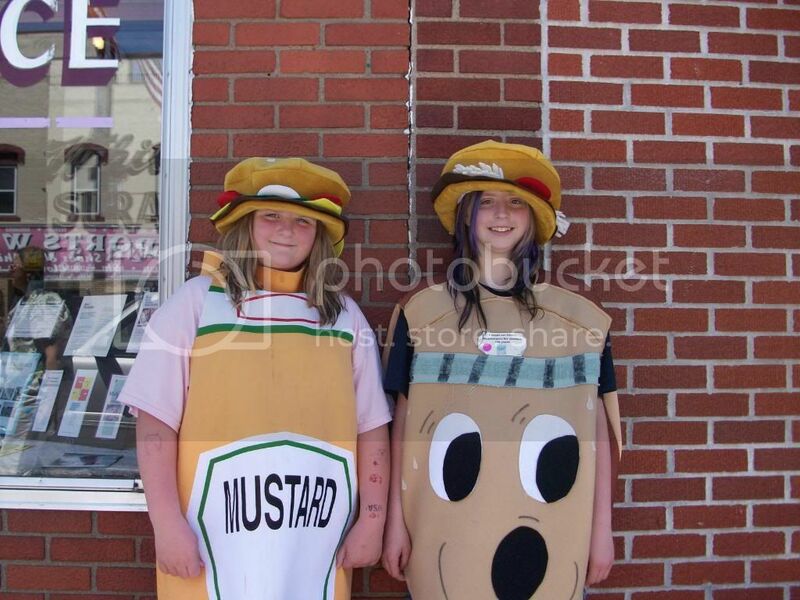 9) History On A Bun - OK, OK. I'll stop talking about the 100th Anniversary of Pete's Hamburgers...right after this. 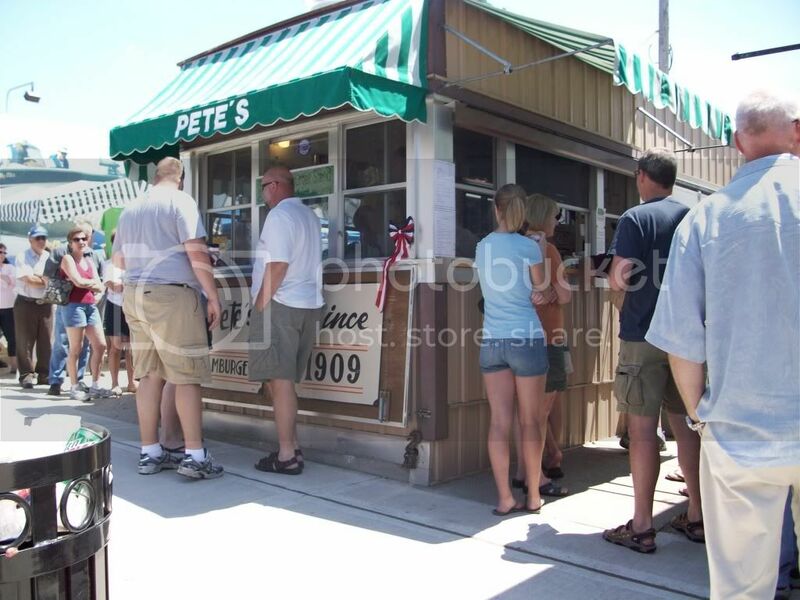 This month marked the official anniversary of the first Pete's burger, an event commemorated with a special program at the Prairie du Chien Museum. Unfortunately, I had to work at the dreaded "real" job, so I couldn't attend, but that doesn't mean that I wasn't there. Apparently, an oral presentation of the history of Pete's even included mentions of my various artistic contributions to the local institution. That's pretty cool. 8) Fun-Fast - For the fourth (or fifth?) 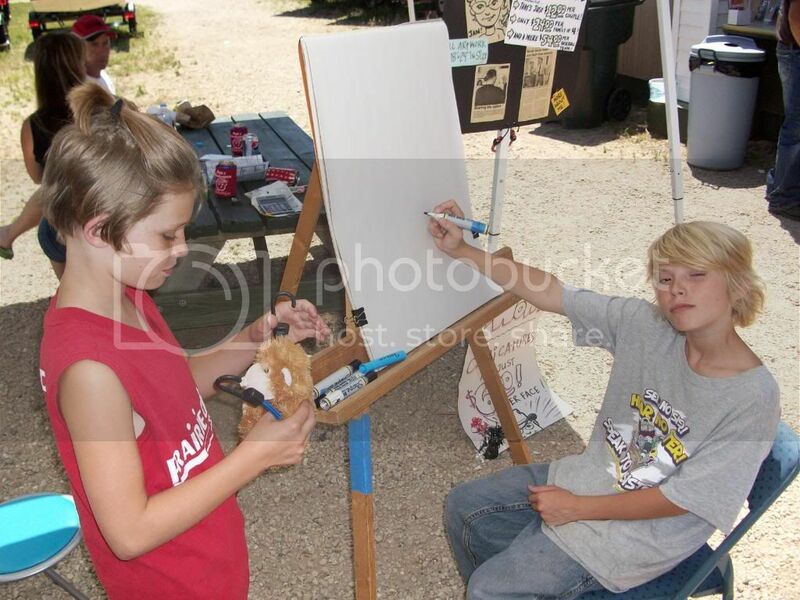 year, I drew caricatures for the Fennimore, Wisconsin, "Fun-Fest." Even though I was there for five hours, I was kept so busy that the time seemed to just fly by. And I had so much fun! All such events have memorable highlights for me. Sometimes those are experiences with difficult customers, but most stem from the unique people I meet while drawing their portraits. Special challenges are also very memorable, such as the super-sweet mom who had a reconstructed face, or the developmentally challenged woman who sat with me for most of the day, watching as I drew, until she finally got the courage to sit for her own caricature. Another challenge has now become something of a tradition (if traditions can be set with only two instances). A young couple had me draw their oldest kid, now two-years-old, whom I'd drawn two years ago when he was an infant in a stroller. Then I drew their new baby, sleeping in that same stroller. 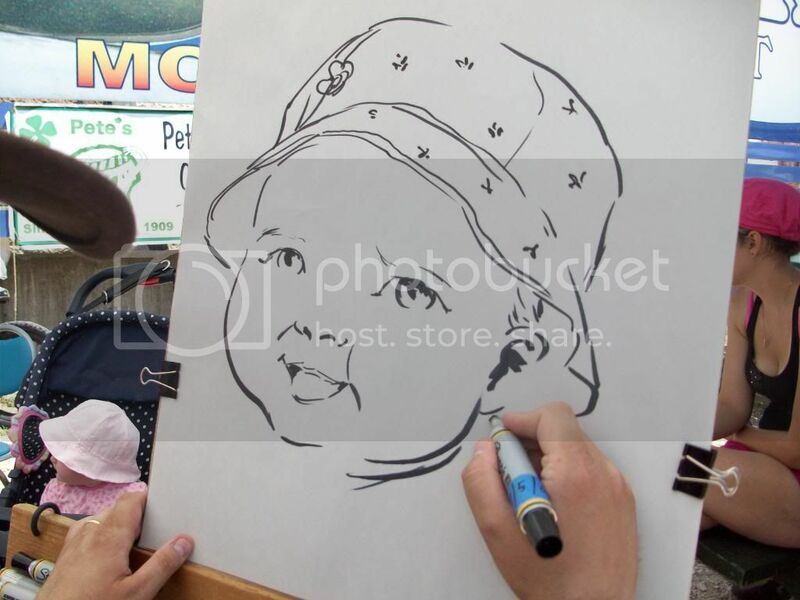 Drawing babies is hard enough, but knowing that the two virtually identical pictures will always be compared? That's definitely a challenge. I was so happy with the result, but I have no photos of the event because I was there sans-assistants. Sigh. Maybe next time. 7) The Great Council - On August 5th, 1825, a "Great Council" of Native Americans and white settlers was held at Fort Crawford here in Prairie du Chien. For days prior to the event, canoe-loads of attendees converged from all directions and included members of the Sioux, Ho-Chunk, Menominee, Chippewa, Ottawa, Potawatomi, Iowa, Sauk, and Fox tribes. 6) Edutaining Fun With Uncle John - Remember my assistants from the caricature drawing I did at Pete's Hamburgers 100th...er, I mean That Food-Stand Celebrating a Special Anniversary? My nephew Colton and niece Alanna (who was named after Adam Strange's wife, by the way) were great helpers that day, and we all had lots of fun together, so, when they asked to spend another day with me recently, I gladly capitulated. They're such great kids, how could I not? 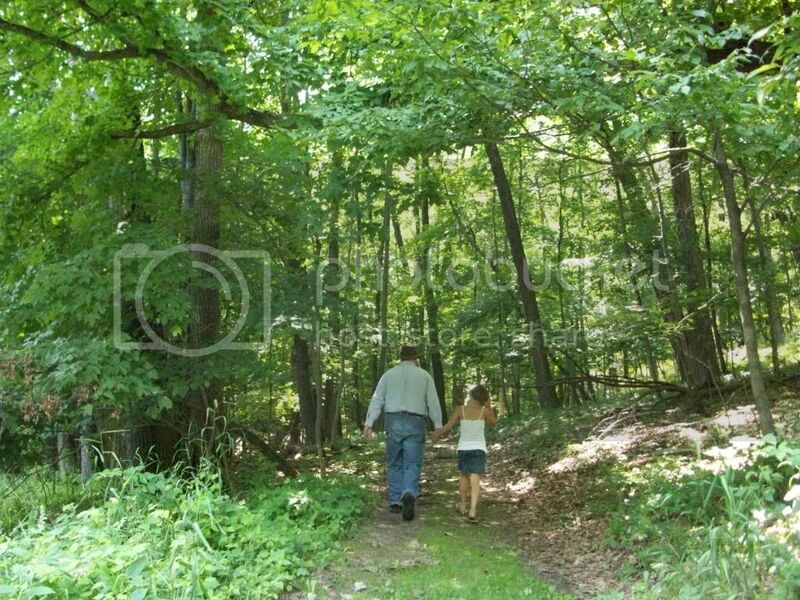 So, with Colton again taking photos, we first went for a fun nature hike in Pikes Peak Sate Park in McGregor, Iowa. We then trudged out onto the remnants of the old 1930's bridge in the middle of the Mississippi River between Marquette, Iowa, and Prairie. I blogged about it sometime in the past, but the kids had never even really realized that such a bridge existed before the current, modern one. Colton especially was excited to find actual artifacts - bolts, lengths of support cable, tarmac chunks, etc. - of the bridge that he could take home with him. He is planning to research the old bridge, find a photo of it, then frame everything in a shadow-box with a brief history. Neat idea! 5) A Fight to Remember - Sometime in August of 1900, the world famous Buffalo Bill Wild West Show came to Prairie du Chien for a performance. As the elaborate production - complete with Main Area events, an Indian village, sideshows, and even horse racing - was being set up, several of the show's performers, cowboys, and other roustabouts wandered downtown to check out...well...to check out the local girls. This, as you might imagine, did not sit well with the local boys, who soon banded together to confront the out-of-towners. Voices raised, tempers flared, and, within minutes, a massive all-out brawl broke out, right in the city's main intersection (then called Church and Bluff Streets, now called Beaumont Road and Blackhawk Avenue, respectively). As the dust kicked up, and the flying fists were beginning to transition to knives, something happened. Some heard a single gunshot. Some heard a loud voice shouting "Halt!" Whatever it was, it caused everyone to stop in their tracks. 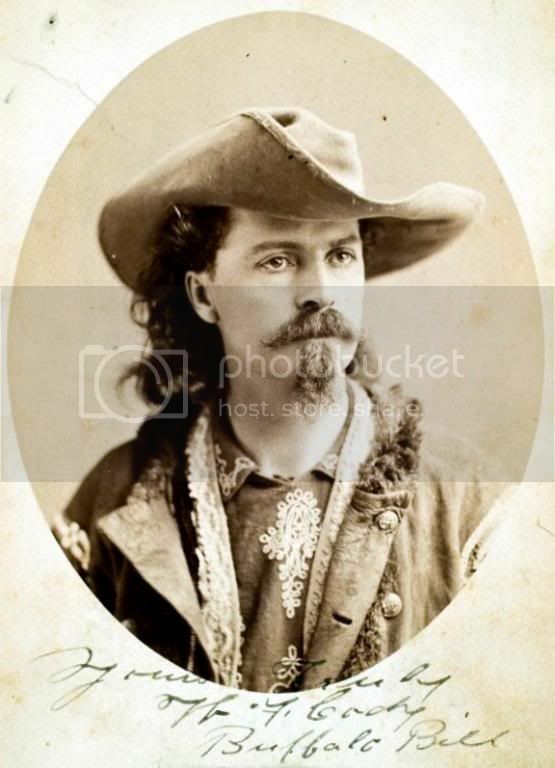 As they looked up, there, astride a glowing white steed, was Buffalo Bill Cody himself. A distinguished man with long white hair and trademark mustache and goatee, Cody dramatically rode directly into the center of the fray, commanding everyone to cease. Whether because of the force of his presence or his signature on their paychecks, everyone calmly dispersed. Disaster was averted, and no-one was seriously hurt. In fact, even the later presentation of the show itself was OK. In spite of the scrap (or because of it? ), it was a sell-out. The event has become legend, and may even seem to you like a tall-tale from long ago. And I might agree with you, if I hadn't known a man who was actually there when it happened! Yep, the same man who would also tell me of his experiences in World War One (as readers of The WOMP-Blog may remember), was there that hot August day. His accounting of the fight has always sparked my imagination. Oh, there are the newspaper reports of the time that corroborate everything, but, for me, hearing it from a participant is so much better...and one of the greatest privileges of my life. 4) More Adventures of Comics - Hey! I'm going to be in Montfort, Wisconsin, on Monday to give my The Adventures of Comics presentation at the Montfort Public Library. I'm scheduled to speak at 2:00PM (until 3:30 or so). Stop in for a visit if you're going to be nearby. 3) A Stearns Warning - I wanted to send a shout-out to freshly anointed Official Fish of WOMP, Brian Stearns. Hi, Brian (and, sorry about the inexplicable "Fish" thing...it's sort of a tradition that...uh...really, it's too silly and confusing to even explain)! Brian, who lives in New Hampshire, is a writer who contacted me about a month ago about using one of my avatar illustrations (Mind's-Eye) for his blog. Since then, we've conversed a few times, striking up a bit of a friendship. We're even planning some collaborations over the next few months. Keep an eye out for those! 1) Bad Axe - On August 1st, 1832 - just six years after the Great Council - as a clumsy, bloody war swept through the area, an armed steamboat (the ironically named Warrior), sent from Fort Crawford in Prairie du Chien, reached fleeing warriors of the Sauk, Fox and Kickapoo Nations (called the "British Band" for their attempts to ally themselves with Britain) on the banks of the Mississippi, where the native force had hoped to cross the river to escape American troops. After being guided by a Sioux Indian, the boat, with its prominent artillery piece, dropped anchor, making an escape virtually impossible. 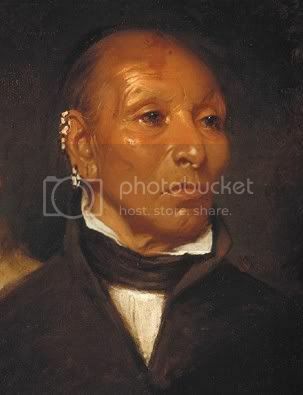 Black Hawk, leader of the British Band, attempted to surrender to the Warrior by waving a white cloth, but the crew either did not understand or, more likely, chose to ignore the message. The boat and its men opened fire, killing a number of unprepared Indians before they could scramble away into surrounding bluffs. and is a direct descendant of Black Hawk! 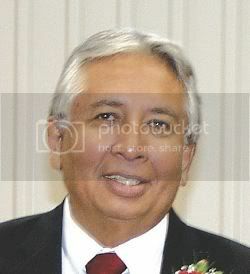 Even though many generations separate the two, Mr. Thurman's resemblance to Makataimeshekiakiak is uncanny! Moreover, the fact that he could be invited - and would then accept such an invitation - to visit the site of his great-grand-ancestor's defeat and imprisonment, speaks volumes to how far we've come in a short 177 years. So, there you have it; a little history, a little cartooning, and a little nonsense. That's what has been occupying my mind these last few weeks. If I could expand the parameters of the list a bit, I'd add an eleventh (unranked) bit of odd local info. August 15th marks the seventieth anniversary of the premiere of the film The Wizard of Oz. Sort of. You see, three days before the red-carpet, star-studded opening in Hollywood, The Wizard of Oz was actually first shown in Oconomowoc, Wisconsin. No one knows why, but, for some odd reason, that's where it actually premiered. In fact, over the next couple of days, the now classic film was shown on several area movie screens, including - as legend has it - here in Prairie du Chien. I have tried to prove the early P.d.C. screening, but to no avail (our local newspapers were not dailies, so they're not much help), and, without real proof of any sort, I can't really call it "history." Still, it's a cool legend, so I thought I'd pass it along. Hmm. Speaking of "passing along," I'm about to pass out from all of this typing, so I should be getting along. Here, for absolutely no reason other than my obsessive-compulsive need to complete even the most inane tasks once I've started them, I present the last of my list of Comic Book Father Characters of The Day - Stone (as in "Turok, Son of..."), Kong (as in "Son of..."), Magneto, Scott Summers, Richard Rich, Sr., Zeus, Bruce Wayne, Homer J. Simpson, Mildew Monster, Goliath, Fred Flintstone, and Jonathan Kent! July 24 - Hiya! Boy, have I been busy! I wish that I could say that my time has been occupied with exciting artistic endeavors, but, with a couple of possible exceptions, I have instead been mired in mundane chores. One of the hidden costs of an extended period of illness is that ignored household tasks pile up exponentially. As each uncompleted project begat three others, and so forth, the ability to easily reign it all in began to slip away from me, until, finally, I had to just dedicate pretty much all spare time for the last two weeks to getting "back to normal." So, as of right now, I'm nearly done. The extensive yard work (pruning old trees, planting new trees, gardening, landscaping, etc.) is done, the new shed has been built and filled with rakes and pots and such, the garage has been cleaned, bills have been paid and filed, I've responded to most of my backlogged correspondence, and I've completed any number of other even more menial, yet necessary, jobs. Now...ugh. Now I am waging a war against the continually accumulating crap cluttering the catacombs beneath WOMP Headquarters. And I think I'm losing. Every time I believe I'm winning, I discover another vein of unsorted comic books, or a hidden cache of boxes and packaging material saved for eBay shipping, and, while sorting it all, I end up with a mess as unkempt as before I began. Sure, I'm making some sort of progress, but only The WOMP Staff and I can see it (and even then only if we squint). I have no one to blame but myself, but it's still somewhat aggravating. To counteract the tedium, I've begun to experiment with the WOMPuter's video-making program. Below is my first attempt, as is now found on YouTube. It's weird. It's worthless. It's WOMPtastic. Watch it with someone you love...then immediately apologize. For now, I'd better get back to work. Someday...someday I may even be finished. Sigh. I guess I'll leave you with a few more of my old, unposted Comic Book Father Characters of The Day - Odin, Doggie Daddy, Peter Griffin, Ben Cartwright, Oliver "Daddy" Warbucks, and Gomez Addams! July 11 - So, let's see...what all have I neglected to blog about recently? Well, I suppose I should tell you that my comic book classes for later today and next Saturday have been canceled. Darn it. Well, at least my last two workshops were well attended. I presented my cartooning spiel a couple of days ago right here in WOMP's hometown of Prairie du Chien, Wisconsin. It was part of our library's Summer reading program, so it drew (ha ha - a pun!) a fairly large crowd of kids (forty or so?). With the exception of a girl who appeared to be in her tweens, most of the crowd was very young (well, excluding parent-types). That meant a heavy emphasis on drawing silly or gross things (for example, my character, LIF-EL - who resembles "a living booger" - was very popular), and less focus on "how to." Even so, I showed the kids how to break down things into shapes, touched upon facial proportions, showed and explained several cartoon strip/comic book storytelling hints and tips, and even demonstrated my patented "Scribble-Dogs" method of finding inspiration/exercising imagination (OK...I'll describe that further some day, but, in a nutshell, it is similar to looking for figures in cloud formations). 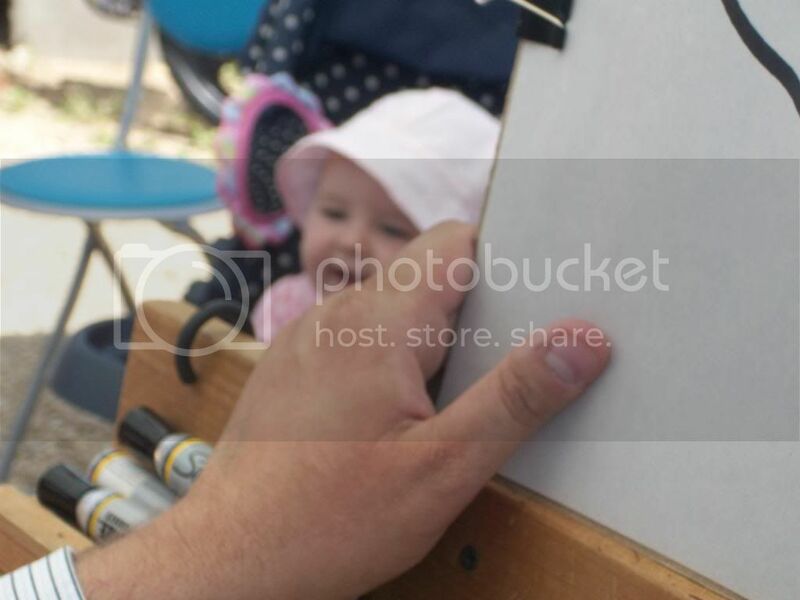 Afterward, I was asked to draw the kids' names from a bucket so that they could pick out prizes. The selection was a little thin, but I added the drawings from my lecture with the other prizes so that every kid could win something! So, one by one, I called out names, and was (egotistically) amazed that the first several kids chose my drawings over Beanie Babies, teddy bears (with the Wisconsin "W" on them and everything), T-shirts, and McDonald's gift certificates. OK, OK...so the two inflatable "guitars" were early choices also, but, for the most part, kids wanted my artwork! Unfortunately, when all of the gifts were given, I still had one name left; Emily, a teensy little girl of about five years. Fortunately, my arm hadn't fallen off, so I drew a special piece just for her. Since she had earlier volunteered that she liked to draw princesses, I drew a grown-up version of her, complete with crown, and called it "Princess Emily." Well, although some of the boys could not believe I'd just drawn such a girlie thing ("without no horns or anything," as one pointed out), Emily was thrilled. Seeing her ear-to-ear smile was like a prize that I had won. A month earlier, I had a much different, yet just as rewarding, experience when I presented my lecture at the public library in Cobb, Wisconsin. Only a handful of kids attended, but they were much more interested in the subject. It's a bit elitist, I suppose, but I think that I would much rather speak to ten kids who really want to learn about cartooning than forty who are "just there." At Cobb, I was able to more fully explain stuff to an appreciative few. These were kids who read Manga and Jeff Smith's Bone, had created their own characters, and wanted to know specific things, like how to draw a fist in three-quarter view. July 10 - Hey there! How are you doing? As for me, I'm about a half hour away from heading to the dreaded "real" job, but I just had to post a little something for you. I have found a good video from the Pete's Hamburgers 100th Anniversary Event held last weekend. It gives you a pretty good idea of what it was like, even though the vast majority of it was shot just minutes after everything began on Friday. 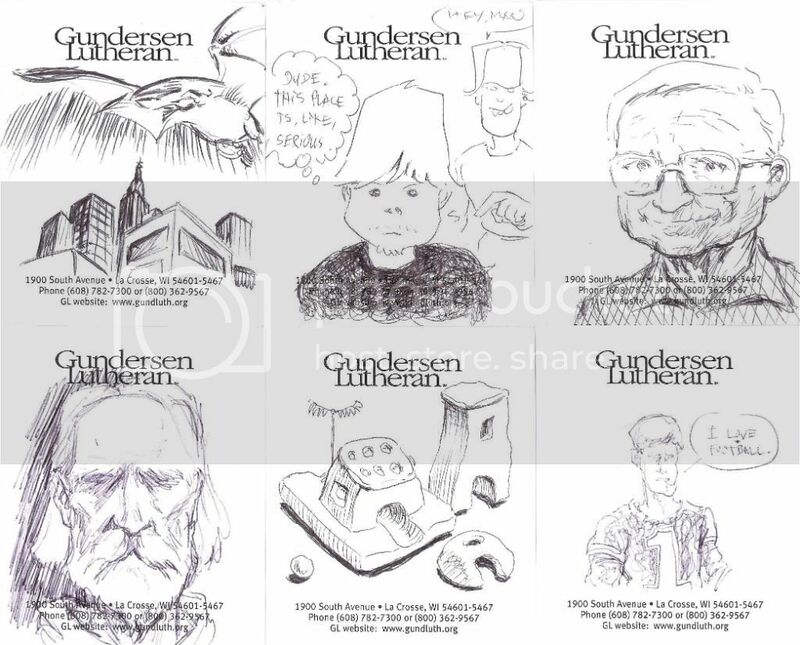 About half-way through, there's even a pretty good sequence of me drawing my first two caricatures. If you'd like to watch it, click HERE to go to the Pete's-specific page on the new pdctoday.com site. As for my own pix and video, well...hmm. On Sunday, my soon-to-be-in-4th-grade niece, Alanna, and soon-to-be-in-6th-grade nephew, Colton, volunteered to help me all day while I drew caricatures. That was a lot of fun, and they were really very helpful, especially in keeping babies and dogs (yes, dogs...sigh) attentive and smiling while being drawn. Colton, in charge of taking photos, did an especially good job. He documented virtually every detail of the event (as well as any cool muscle car or motorcycle that drove by). He also took almost a half-hour of video in ten and twenty second snippets, but much of it is unusable, and all of it is fighting with my WOMPuter's video editing software. I'm still trying to cull the footage to a handful of interesting clips, after which I will post them to YouTube. Until then, I think I'll post some of his photographs on The WOMP-Blog Archives. Well, I've got to get to work now, so I'll leave you with your Comic Book Father Character of The Day - Craig Robinson! July 7 - Well, that was incredibly sad. Like so many others, I watched Michael Jackson's public memorial service this afternoon. I had intended to view the event with detached, almost scholarly interest, but I was crying like a baby by the first shaky lines of Mariah Carey's "I'll Be There." Look, I grew up with The Jackson 5, was a teenager for Thriller, and have been an active observer of Pop Culture since college. For better or worse, Michael Jackson meant something to me. I don't know exactly what, but it was definitely something. Of course, I've been to way too many funerals recently, so that didn't help. Hmm. So...I was trying to get back to wrapping up my Pete's Hamburgers 100th Anniversary report, but I just couldn't (partly because YouTube was undergoing service, so I couldn't upload my awesome Pete's videos!). Now I've got a cartooning lecture/workshop in a few hours, so I'm going to bail tonight as well, but I will get back to it later, I promise ('cause I know you've been on pins and needles waiting for it). For now I'll leave you with your Comic Book Father Character of The Day - Fred Andrews! "Madam Speaker, I rise today to honor Pete's Hamburgers"
July 4th - Well, I survived Day Two of the Pete's Hamburgers 100th Anniversary Event. The day was rainy and cold while I was there, but the crowds were even larger than yesterday! I forgot my camera (UGH! ), so I will have to wait until at least tomorrow to post any pictures for you. There were festivities and special events all day, including live music and more radio broadcasts. 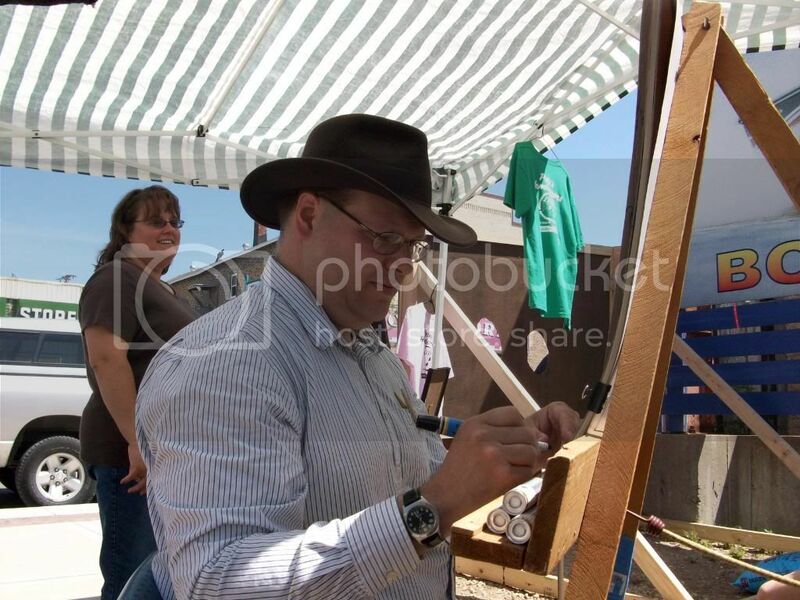 Starting at 10:00AM, I drew caricatures for four hours, having only one short break from 1:15 to 1:20. Just as I was wrapping up for the day, Congressman Ron Kind, straight from Washington, D.C., stopped by to present Pete's Hamburgers with a U.S. flag that had been flown over the the Capitol Building. And this was on the Fourth of July! •Madam Speaker, I rise today to honor Pete's Hamburgers of Prairie du Chien, Wisconsin and to recognize their 100th anniversary. •It is reassuring to see that despite these tough economic times many American small businesses are still thriving. It was 100 years ago when Pete Gokey opened Pete's Hamburgers as a small, humble stand selling pan-fried hamburgers. Pete Gokey's life embodies the hard work, dedication, and commitment that have made our country great. •Although we recognize it today for achieving the feat of keeping its doors open for 100 years, the story of Pete's Hamburgers is one founded upon an individual's commitment to public service and hard work. Before opening his stand to sell hamburgers, Pete Gokey was a member of the volunteer fire department in Prairie du Chien. As fate would have it, Pete was selected to be the chef for one of the fire department's community events, at which he was expected to serve fried hamburgers with onions. The hamburgers were a huge success and became the catalyst for Pete Gokey's successful stand. •Gokey was able to turn his stand into a fixture of the Prairie du Chien community. Whether serving hamburgers or volunteering as a fire fighter, Pete Gokey was a man who lived a life based on hard work and service to his community. •Pete's Hamburgers and its quality product have stood the test of time and I proudly stand before this chamber to recognize the success of Pete and his family who have dedicated their lives to something they love: hamburgers. •I applaud the efforts of Pete Gokey and his family members who now run the business and I am proud to see their hard work rewarded by 100 years of business and 100 years of service to the Prairie du Chien community. May their success continue for many more years to come. Pretty cool, huh? Now that's impressive. Well, I hope you all had a great day. I'm going to leave you for now with a special Independence Day Comic Book Father Character of The Day - George Washington! July 3 - Day One of the Pete's Hamburgers 100th Anniversary Event is in the books, and, man, what a crowd! At any given time, the throng numbered between fifty and a hundred people...and this is just for hamburgers from a street vendor (a well-established one, but a street vendor nonetheless). Of course, there were many other things to do and/or buy during the day's celebrations. 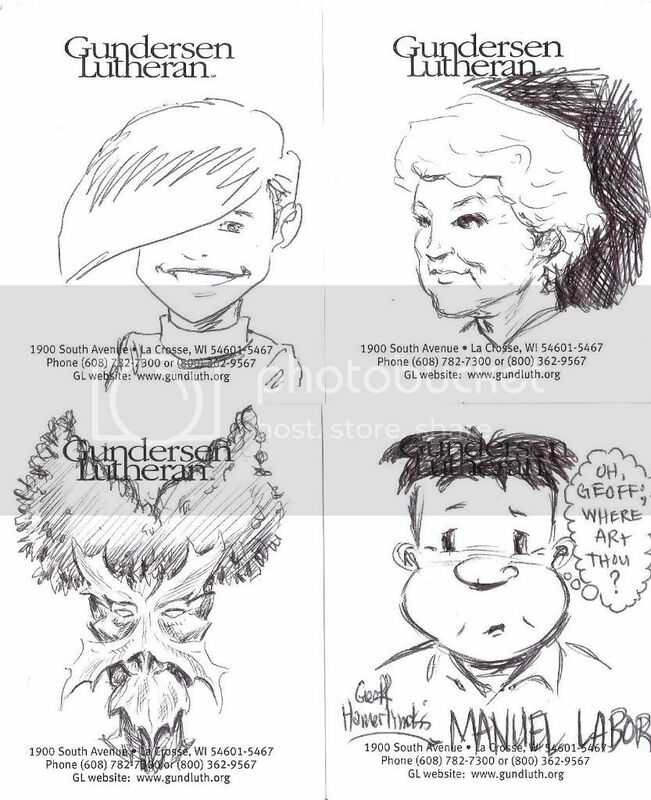 I was kept busy drawing my cartoon-portrait-style caricatures from 11:00AM to 2:00PM. It was crazy! I was interviewed by the local radio station (by O.F.O.WOMP Norb Aschom), during which I learned that I had been the answer to the daily call-in quiz! I was also filmed by two area television station news crews (not exclusively, of course...just as one of the anniversary events), and was part of at least two podcasts. If I find any of that stuff on-line, I'll post it here somewhere so you can point and laugh. In fact, I'll try to take my own little film or photo series tomorrow, but I can't promise anything. If I'm as busy on Saturday as I was today, I definitely won't have the time. In fact, I should probably go get some extra rest right now. Have a happy Fourth of July everyone! Here's another long-overdue Comic Book Father Character of The Day - Trigon!